Summer is the perfect time to learn something new, do something that you always wanted to do or just have some fun! One of the items on my must do list is the free mini classes over at Craftsy! Why not grab a friend and get together to learn more about your hobbies and interests?! You never know how creative you can be until you try! Are you looking to take your crafting to the next level, or perhaps branch out and learn a new skill, but aren’t sure where to get started? Check out the Craftsy Free Classes, mini classes that allow you to sample everything from food classes (Who couldn’t use Complete Knife Skills with Brendan McDermott? ), to quilting (How fun would A New Look at Longarm Quilting with Mandy Leins – FREE! be? ), to photography (Seriously, Learn How To Take Professional Family Portraits with Craftsy for FREE! could only help us all.) and more! 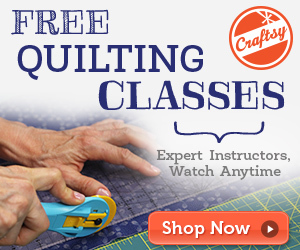 Just register for your Craftsy account and get started!